Gulf of Mexico is the Gag Grouper. Since it is found throughout the area, it is one of the more popular types of grouper that is caught during grouper fishing excursions. Description: The Gag Grouper closely resembles the Black Grouper, although it is lighter in color. It sports an overall grayish, brown color with “kiss-shaped” marks all over its body. Alternatively, the black grouper is much darker and has box-shaped markings. Like most grouper the Gag grouper is a protogynous hermaphrodite, meaning that all grouper are female when they are born and larger fish develop into males as they age. All Gag Grouper under 32 inches long and 5 years old are female. Size: It is common for Gag Grouper to range in size from 10 to 20 lbs., but larger fish ranging up to 50 lbs. is possible. Their size makes them fun fish to catch, and they are of excellent eating quality should you choose to keep your catch. Location: Adult Gag Grouper are commonly found off shore near reefs, rocks, wrecks, and other forms of bottom relief and cover in waters from 60 to 250 ft., sometimes exceeding 500 ft. The deeper the water you choose for Gag Grouper fishing, the larger the fish will be. Young and juvenile Gag Grouper, all female, are found much closer to shore as they grow. They are most commonly found in bays and estuaries, making them perfect for inshore and flats fishing charters throughout the Tampa Bay area. 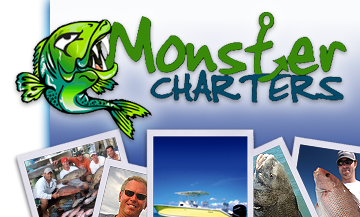 Contact Monster Charters today for more information about the Gag grouper fishing charters we offer and how we can hook you up with the fishing experience of a lifetime!